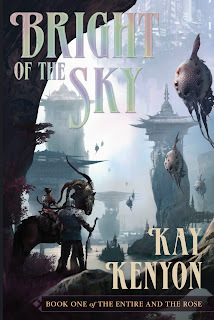 After reading Kenyon's Bright of the Sky (Canada, USA, Europe), I knew that an interview was in order. And with A World Too Near (Canada, USA, Europe) hot of the press, the timing was perfect. Many thanks to the folks at Pyr for helping us put this one together, and thanks to the author for accepting the invitation! - Without giving anything away, what can you tell potential readers about The Entire and the Rose? It’s the story of Titus Quinn’s odyssey through a strange alien empire. Titus is in search of his lost wife and daughter, but is soon diverted to the larger conflict between our cosmos (the Rose) and the new one (the Entire.). The Entire is a lost realm, the seat of an ancient civilization. Artificially created, the Entire is a tunnel universe burrowing through the Rose. The milieu has a decided fantasy feel, as does the overarching quest theme. You’ll encounter immense fortresses, floating gas bag creatures used for transport, psi-enabled war mounts, and prophetic, half-mad river pilots. Some of the stranger aspects are the Entire’s spacetime folding river that allows travel to the far reaches of the universe, a sky that is permanently on fire, and storm walls that form the sides of the tunnel and are powered by . . . but you said not to give anything away. If this all sounds epic, I would say, absolutely. But it is also a deeply emotional story. My first hope in writing this series was to portray a charismatic hero, someone believable and flawed, that readers could root for. Someone who wasn’t too hip or cynical to engage with big issues and sacrifice himself if necessary. I enjoy noir cool as much as the next reader, but sometimes these folks are hard to live with through a long novel—not to mention four! - Bright of the Sky garnered a slew of positive reviews. How has A World Too Near been received thus far? Well, it’s early yet, but the reception started off with a starred review in Publishers Weekly. Sci Fi Weekly found the characters still “fascinatingly complex,” and said the creation of the Entire “seems inexhaustible.” Rob Bedford of SFFWorld.Com said he was “unable to stop reading.” I’ve taken a few knocks for pacing and withholding some details of the milieu, but I haven’t had a bad review yet. - The Entire and the Rose seems to be a "breakout" series/storyline for you, despite having received a positive response on your earlier books. What do you think helped to make Bright of the Sky such a success? Darn, I was hoping you could tell me. I mean, writers usually have at least peripheral vision directed at the marketplace. They might well ask themselves: Why did such-and-such a book tank so badly that I had to go to World Con disguised as a weasel? So, I have no clue why this one is doing so well. Yet, I will answer as though I did: Every reviewer has emphasized the scope and originality of the world building in the milieu of the Entire. To quote one reviewer, the Entire knocked his socks off. What was lucky for me was how the milieu went on to suggest creatures and characters who are memorable, I believe, in their own right. - What can readers expect from the two forthcoming sequels? - What's the progress report pertaining to the third volume, City Without End? Submitted to Pyr. Publication date for hardcover, February ’09. The artwork is stunning, and Stephan Martiniere recently won the Silver Spectrum Award for it. - What was the spark that generated the idea which drove you to write The Entire and the Rose in the first place? I asked myself how I could write an epic sf/f story that would have a very big stage and yet not be inter-galactic, employing the tired mechanisms of FTL travel or quantum teleportation. A parallel universe would be only a partial answer: how do they get around? I thought, then, of a tunnel universe, a geographically contiguous, yet infinite place. This is too bizarre, I thought. It’ll never work. I immediately started writing it. - What were some of your inspirations for the various creatures, races, customs and cultures, as well as the detailed worldbuilding? Well, ancient Chinese, obviously, for the ruling bureaucracy. Inspirations for some of the alien species were C. J. Cherryh, Larry Niven, and Vernor Vinge. I came to see how my subconscious did riffs on some cultural aspects of Dune. I absolutely deny that the Gond are related to Jabba the Hutt (but late at night I worry about it.) I think the Entire is unique as a setting, but I was inspired by what the authors could compel us to believe in such books as Ringworld, Riverworld, and Hyperion. The emotional lives of characters revealed in bizarre landscapes. - Were there any perceived conventions of the science fiction/fantasy genre which you wanted to twist or break when you set out to write The Entire and the Rose? Well, first off, I wanted to celebrate some of the traditions, and make the story an unabashed fantasy quest. 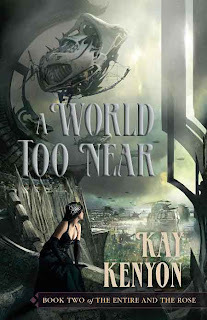 Insofar as the story has science fiction underpinnings, I did twist the usual space opera protagonist, making Titus Quinn deeply divided in his loyalties. Through the eyes of his daughter, Sydney, we get an unsparing view of Titus. Her deeply ambivalent feelings for Titus highlight his dilemmas and explore the question of how it’s possible to do good when all actions will create suffering. I wanted to turn a Flash Gordon concept into the thinking reader’s adventure novel. It’s been done in our field, but only by writers I’m not brazen enough to compare myself to. As the story proceeded, I wanted to create fault lines in the reader’s assumptions about the Tarig overlords, who by tradition we want to despise. A pervasive goal was to give each character their value as a sentient being. This emphasis on character is also, in my view, a departure from the classic adventure tale. - When the idea for the series/story first came to you, was it your intention to sort of marry the sensibilities of fantasy with hard science fiction concepts? A Planetary Romance for the 21st Century? - We as readers are two books into the series and you must be on about the third book in a writing sense. How well do you feel you know the characters? Do you think Titus will continue to surprise you as he's surprised readers? Titus is the one that I know the best and the least. He suffers from a clash of duty and intensely personal choices. The dilemmas drive his reactions. As the dilemmas keep building, I’m not always sure what he’ll do, except that he’ll try to do the right thing. Some readers have questioned whether he does always choose the best thing. To which I’ve been responding, “Well, what would you have done?” Dilemmas, see? Well, how many weeks on the NY Times bestseller list? Guess I can be bought, but how lovely to appeal to a broad spectrum of readers. That’s what every writer hopes for: to tell a story that many people find memorable. What would feel cheap to me is if the sf/f community found my NY Times bestseller derivative and bland. I’d so much rather bring good sf/f to a wider audience than to abandon the sense of wonder and originality that our community values. See, my heart is good! So come on, guys, I can’t have a Hugo, then? It’s great fun to hear people’s reaction to this story. They’ve shared this imaginary world, and believed in fictional characters. When you think about it, this is a pretty strange mental and cultural phenomenon. It’s all made up, and yet we’re discussing it as though it’s real. There is an odd meta-pleasure in that, almost as though we’ve collectively pulled one over on reality. I’d like to encourage people to interact with me; I don’t always need praise; challenges and questions have already given me a lot to think about. I’d like to hear reactions from readers at my blog, http://kenyonsf.livejournal.com/ or through my website, http://www.kaykenyon.com/. - Cover art has become a very hot topic of late. What are your thoughts pertaining to that facet of a novel, and what do you think of the magnificent covers that grace your books? I hope that representational cover artwork is not going to vanish from our field. It’s a sf/f tradition, and one that I particularly love. It’s married to our highly imaginative literature in a way that does not pertain so much to mysteries, for example. 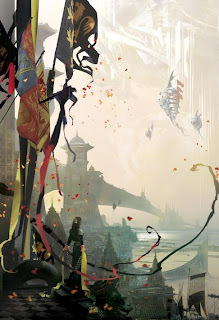 Stephan Martiniere’s glorious covers for the first two books have frankly, all by themselves, made my year. The series is so deeply visual. I thought I knew exactly how it looked. Then when I saw his covers, I thought: no, this is it. But you would never take a space opera and give it just a big text treatment—that would be like dancing the tango in sweats. It just doesn’t go. I hope we keep experimenting with cover art but I also hope we don’t start acting ashamed of our genre’s fantastical side. This is a constant push-pull. I’m addicted to certain websites and blogs. But when I have looming writing deadlines, I have to go on a web diet, or the writing time seeps away. Alas, I am a slow writer. I deeply envy people who are not. I don’t chase my name on the web; the work is narcissistic enough! I use the internet to get outside of myself. - How has it been working with PYR, as a relatively new imprint? I am extremely happy at Pyr. I’ve been involved in production and marketing decisions (cover art, e.g.) and am kept in the loop on issues large and small. I have to say that Pyr seems to offer the best of big press and small press. This is my second experience with an extremely talented editor. Lou Anders at Pyr (and parent company Prometheus Books) has hugely supported this series in traditional paths and in the internet landscape. Personally, I find Lou Anders’ enthusiasm contagious and enormously reassuring. Plus, he answers emails right away. No. People just don’t get it. It’s the height of ignorance and snobbery. We are judged by the worst that we produce, so we have some responsibility, here. But not much. Despite all the dreary and pretentious literary novels out there, we are accused of having warts. Literary snobbishness is despicable one-upmanship that would be laughable if I could laugh about something so dark, evil, and just plain annoying. Stop worrying about who I’m going to kill off. Don’t put these suggestions in my mind! I was trying to be nicer in these books. You really have to quit inspiring me to read so many books I've never heard of. I'm a pitifully slow reader so I'm stressing out here! How to pick and choose? ;) Will definitely check out 'Bright of the Sky' at the bookstore.